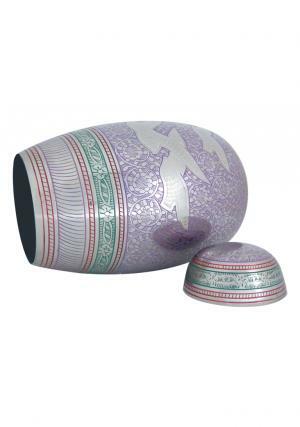 Dome Top Flying Doves Purple Althorp Cremation Adult Urn has a detailed engraving of purple floral swings and flying white doves decorated beautifully on silver background. The brass metal engraved urn is circled with bands of floral design in green and chained bands in red. 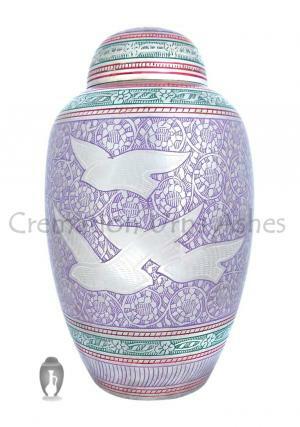 The dove urn has a high quality encryption with pure artwork from skilled professionals. 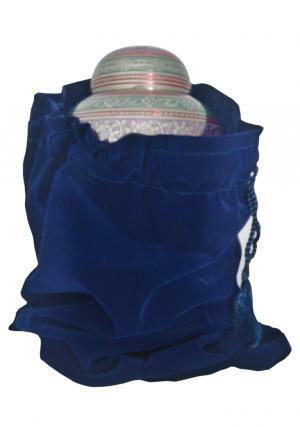 The Floral dove adult urn is secured with lid on the top and encrypted with screw threading for an easy usage of insertion ashes. The large adult memorial urn is capable to preserve 200 cubic inch of human adult ashes approximately. 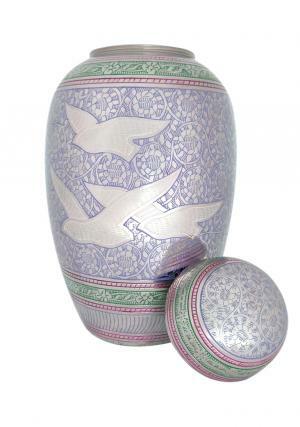 The Dove Adult cremation ashes urn is measured with dimension of 10.63 inch height, 6.30 inch width and weighs 1.76 kg(empty).